Researchers at Mbarara University of Science and Technology (MUST), near Kampala, Uganda are testing an olive oil and honey wound dressing in an attempt to reduce maternal deaths following Caesarean deliveries. 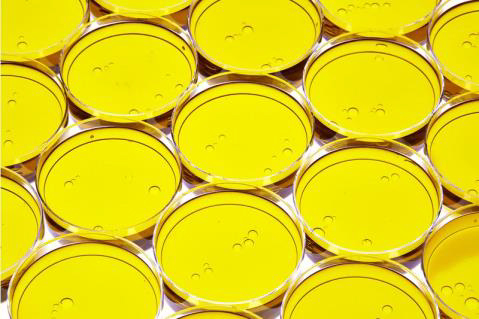 Another remarkable use for olive oil and its protective properties! Mighty small: Bugs for Bugs staff member Maigen Dowley with some of the mealy bug agents. 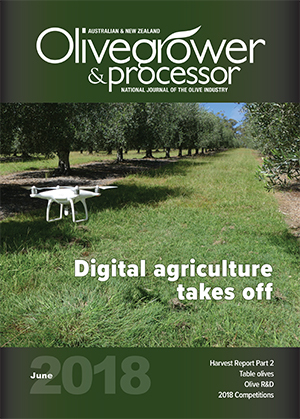 A Queensland bio-control company is working hard to keep up with the demand for their products as an increasing number of producers look to new methods to combat pests. 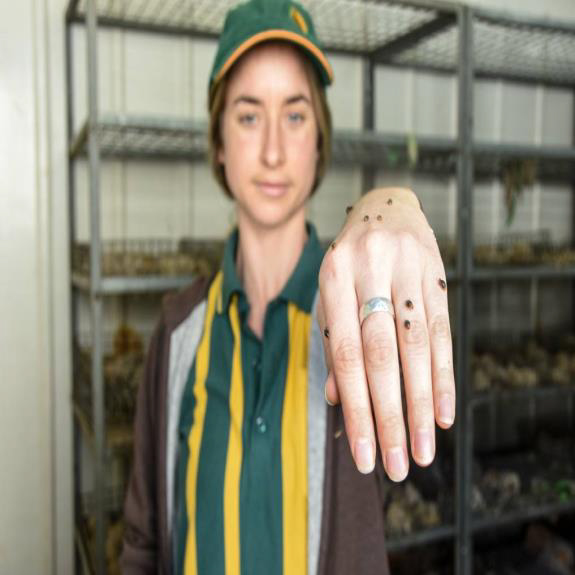 Bio-control is one element of Integrated Pest & Disease Management (IPDM). Learn more at the AOA IPDM project field days, coming to your state soon. More here . National Australia Bank has bent to the pressure brought by the royal commission and will stop charging drought-affected farmers penalty interest rates for missed repayments, despite telling the inquiry just a few weeks ago that the practice met community expectations. 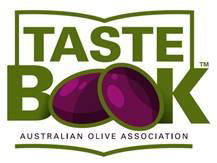 Olive producers, marketers, food service and competition judges are invited to register now to participate in Round 4 of the Tastebook™ program, a sensory training initiative in appreciating, describing and understanding how to improve the quality of EVOO and table olives. Tastebook™ Round 4 samples and basic instructions will be posted to registered participants from the week commencing 6 August. Detailed instructions and training materials will be emailed to registered participants, with a link to the Tastebook™ Round 4 on-line Survey Monkey response form, which will be ‘live’ from 6 August-3 September. Register here for Tastebook™ Round 4 (closing date 13 August) and learn more about Tastebook™ here. Despite the fact that there are literally hundreds of diets out there which all prescribe different approaches, there are a handful of foods that most of these regimes agree are some of the best foods nutritionally that we can eat. It’s no surprise that number one on the list is EVOO. Running your own horticultural business can be rewarding, yet demanding. Financial and other pressures can mount, putting a strain on your family and personal life. 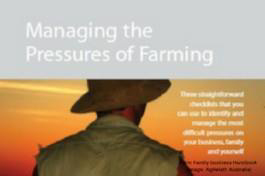 The Farm Family Business Handbook is a resource that growers can use to help them navigate through those tougher times. Access it here. Farmers who have spent more than $8000/year on energy can apply for free on-farm energy assessments under the new $30m Agriculture Energy Investment Plan. Ongoing until March 2020 or until funding is exhausted. More here. A free agribusiness-linked resource library is available from the Agribusiness Development Institute, which is also running subsided courses. More here. Olives harvested by hand and pressed within 36 hours yield oil which may remain fresh for longer periods of time, according to new research from Namık Kemal University in Turkey. Chinese tariffs on American farmers have tanked prices of the two agricultural commodities. Olive oil appears to be weathering the storm, unaffected by these latest developments. A recently revised study suggested that a nutritious diet with healthy fat is more beneficial to the heart than a low-fat diet. Chef Seamus Mullen, President of the Spanish Olive Oil Interprofessional Pedro Barato, Consul General Rafael Conde De Saro and Manager of the Spanish Olive Oil Interprofessional Teresa Pérez at Olive Oils from Spain and the European Union ͞Olive Oil World Tour͟ kick-off event at Cervantes Institute of New York on July 12, 2018. Photo: Rina Oh. The Spanish Olive Oil Interprofessional trade association, with the financial support of the European Union this month launched a three-year, multichannel campaign to promote olive oil as an integral part of the Mediterranean diet (MedDiet). The world’s largest olive oil company is launching an offensive against what it sees as a proliferation of ‘fake news’ articles and click-bait headlines disparaging its brands. Home cooks have plenty of options when it comes to choosing which type of oil to sauté, bake and drizzle with. Some, like olive oil, are well known, and others, like avocado or coconut oil, are less familiar. Which oil is right for you?